Woodruff School of Mechanical Engineering Associate Professor Peter Loutzenhiser has been awarded the 2018 Yellott Award by the Solar Energy Division of the American Society of Mechanical Engineers (ASME). 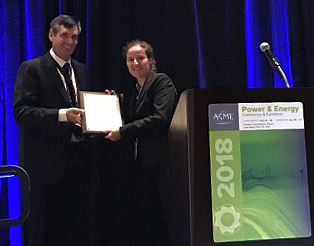 Dr. Loutzenhiser received the award during the 2018 ASME International Conference on Energy Sustainability held on June 24 -28, in Orlando, Florida. The highest award of the Solar Energy Division, the Yellott Award, honoring the ASME Solar Energy Division’s first chair Professor John Yellott, is presented every two years to an outstanding individual who has contributed significantly to the division. The award also recognizes outstanding leadership in ASME and significant contributions to solar engineering through research, publication and education. Dr. Loutzenhiser was selected for the 2018 award for his research on Solar Thermochemistry and the development of related Solar Concentrating Technologies. His primary research focuses on concentrating and storing sunlight in a chemical form and emphasizes applying the fundamental phenomena of thermodynamics, chemical kinetics, and combined heat and mass transfer to real-world engineering applications in solar thermochemistry. In addition to receiving the award in Orlando, Loutzenhiser also presented the ASME 2018 Yellott Award Lecture entitled Solar Thermochemical Pathways for Energy Conversion, outlining the history and several thermochemical pathways for solar fuels and electricity production, and exploring the multidisciplinary aspects of his research. Loutzenhiser received his PhD in Mechanical Engineering from Iowa State University in May 2006, and conducted his PhD research at the Swiss Federal Laboratories for Materials Testing and Research (EMPA) in conjunction with the International Energy Agency Solar Heat and Cooling Programme Task 34/Energy Conservation in Buildings & Community Systems Annex 43. He was a post-doctoral researcher at the Paul Scherrer Institute, applying his extensive solar experience to the field of Solar Thermochemistry, and continued his research at the ETH Zurich in Solar Thermochemistry as a Lecturer and Research Associate prior to joining the faculty of the Georgia Institute of Technology in 2012. He has been actively engaged in the ASME‘s Solar Energy Division since 2009 and has been active on the Executive Committee, serving as its chair from 2015 to 2016.